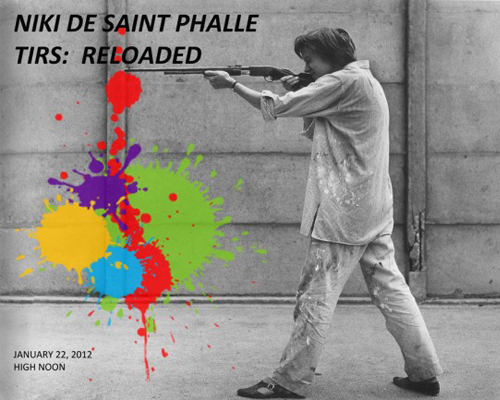 At high noon on Sunday, 22 January 2012, the PST Performance and Public Art Festival in Los Angeles will stage “Tirs: Reloaded,” an hommage to Niki de Saint Phalle commemorating an extraordinary event that took place fifty years earlier. Flashback to Los Angeles, spring 1962: Invited to California by legendary gallerist Virginia Dwan, nouveau réaliste artist Niki de Saint Phalle realizes the tirs (“shooting paintings”) with her partner, Swiss artist Jean Tinguely, for the first time in the United States. In front of a crowd that includes John Cage, Ed Ruscha, Jane Fonda, and Leo Castelli, Niki creates assemblages of disparate objects and bladders of paint which, when shot, transform spontaneously into wild dispersions of colors and textures. If you’re in Paris on Wednesday 14 December, be sure to stop by for the opening of the new exhibition at Galerie Guy Pieters in the 8th arrondissement. The cocktail de l’exposition runs from 5pm to 8pm on 14 December, while the show itself will run from 15 December 2011 through 28 January 2012. Galerie Guy Pieters, located at 2 Avenue Matignon in Paris, is open TuesdaySaturday from 10am to 7pm and can be contacted by phone at +33 (0)1 42 89 26 83 or via email at paris@guypietersgallery.com. A “unique and beautiful” £2 million collection of art is to be donated to Glasgow. The 15 works by the French artist Niki de Saint Phalle, the most significant bequest to the city’s galleries in recent years, are being donated to the city by Eric and Jean Cass, business people who have collected art for more than 30 years and are now dispersing their collection through the Contemporary Art Society. The works, including sculptures, a print, wallpaper and rare archive material, will make it the largest collection of the French artist’s work held in the UK, and will be shown at an exhibition planned for the Gallery of Modern Art (GoMA) in 2013. The gift, presented by the Contemporary Art Society, adds to the two sculptures and two installations by Niki de Saint Phalle Glasgow already owns. The collection of 15 works is understood to be worth around £2m. 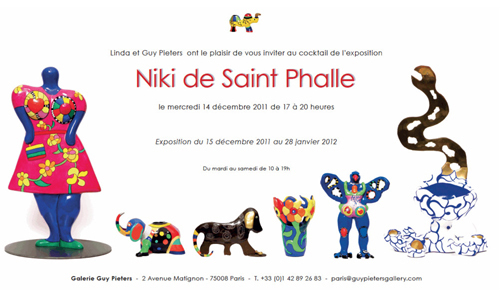 Saint Phalle was born in 1930 in France and died in 2002. She began producing her first paintings in 1950, and this led to plaster works and her “shooting paintings”  these pictures were made of plaster, with containers of paint beneath the surface, which would explode when she shot them. In 1965, she created her first “Nana”  these large and brightly painted female figures were made originally in papier mâché and later in polyester. She also designed stage sets and costumes and created movies, graphic work, chairs and a sculptural playground. In 1988, Saint Phalle helped to design the iconic Stravinsky Fountain at the Pompidou Centre in Paris. Councillor Gordon Matheson, the leader of Glasgow City Council, said: “This extraordinary and generous donation is unprecedented for GoMA so it’s hard to properly express just how grateful we are. “The support from the Contemporary Art Society coupled with the incredible generosity of Eric and Jean Cass has allowed us to once again grow Glasgow’s collection of international modern art. Eric and Jean Cass, who live in England, were unavailable for comment. However, they have dedicated more than 35 years of their lives to collecting and supporting artists, building a collection of more than 300 sculptures, ceramics, drawings prints and paintings including work by such artists as Barbara Hepworth and Henry Moore. Paul Hobson, the director of the Contemporary Art Society, said: “We are delighted to be able to make this gift to Glasgow Museums. “Working with Eric and Jean Cass and learning more about the collection that they have so carefully developed over the years has been inspirational. “The Contemporary Art Society has a unique view of public collections across the UK and this gift is one of many initiatives that we are championing in museums across the UK. Glasgow’s contemporary art scene has been highlighted in UK and international news in recent weeks, following the success of Martin Boyce, a Glasgow-based sculptor, in winning the Turner Prize, the most prestigious award in contemporary art. Boyce scooped the £25,000 award, following in the footsteps of fellow Glasgow artists Susan Philipsz and Richard Wright. Founded in 1910, the Contemporary Art Society exists to support and develop public collections of art in the UK. It raises funds to purchase and commission new works for a network of public collections, which subscribe to it as Member Museums and Galleries, and by soliciting gifts of works to these collections for public benefit. A “unique and beautiful” £2 million collection of 15 works of art by Niki de Saint Phalle is being donated to the city of Glasgow. The 15 works, the most significant bequest to the city’s galleries in recent years, are being donated to the city by Eric and Jean Cass, business people who have collected art for more than 30 years and are now dispersing their collection through the Contemporary Art Society. The works, including sculptures, a print, wallpaper and rare archive material, will make Glasgow’s the largest collection of the French artist’s work in the UK. They will be shown at an exhibition planned for the Gallery of Modern Art (GoMA) in 2013. The gift, presented by the Contemporary Art Society, adds to the two sculptures and two installations by Niki de Saint Phalle that the city already owns. Read more. PARIS — Half a century ago, fairground hucksters in Europe would whet the curiosity of provincial crowds with dead whales and giant squids, pickled in formaldehyde and carted from place to place aboard large trucks designed for the purpose. These days dead sea monsters are out. Art’s sacred monsters are making the rounds instead. 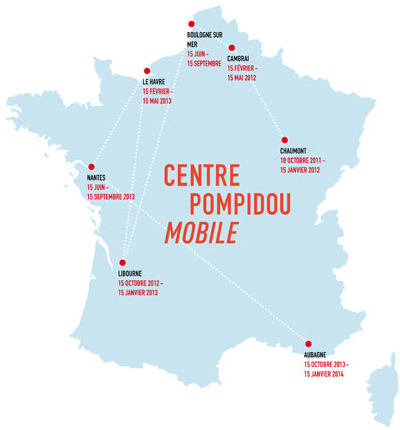 Chaumont-sur-Marne, a small town in eastern France, population 30,000, is the first stop of the new Pompidou Mobile, a travelling gallery of modern and contemporary art conceived by Alain Seban, the current director of the Pompidou Center in Paris. One in two people in France has never visited a museum, according to Mr. Seban. So in 2007, he said during a recent interview, he decided to take his museum to the French. The director chose the iconclastic architect Patrick Bouchain, a specialist in nomadic constructions, to execute his project. The result is three tents, shaped like origami birds, covering a total area of 650 square meters, or 7,000 square feet, that can be fitted together in a variety of configurations to adapt to the available space. Two tents hold the exhibition spaces and another the reception area. The total cost of designing and building the project was €2.5 million, or $3.3 million, financed by the Pompidou Center, the Ministry of Culture and a group of four private-sector sponsors (Galeries Lafayette, GDF SUEZ, La Parisienne Insurance and the Total Foundation). The curator Emma Lavigne was chosen by Mr. Seban to put together “La Couleur,” the Pompidou Mobile’s first show, which opened in Chaumont in mid-October and runs until Jan. 15. Inside the tents are displayed 14 masterpieces from the Paris museum’s permanent collection. The artists include modern masters  Matisse, Picasso, Braque, Léger, Alexander Calder and Niki de Saint Phalle  and a sprinkling of contemporary artists including Olafur Eliasson and Bruce Nauman. The exhibition area inside the tents is a sequence of spare, white uncluttered spaces, each dominated by a large display caisson. The caisson, a sort of giant safe, showcases the paintings through non-reflective security-glass windows. Sculptures and mobiles are distributed around the perimeter of the spaces, placed to create a dialogue between the sculptural and pictorial displays. An audio guide gives a concise, jargon-free explanation of each work in a choice of languages while local actors have been hired and trained by the Pompidou as tour guides for group visits, reciting a specially written story-line enhanced with sound effects. Chaumont’s actor-guides will in turn train a replacement team from Cambrai, where the museum will next set up camp on its tour of France, early next year. From Cambrai it heads to Boulogne-sur-Mer in May. In sharp contrast to the minimalist interior, the outside is brightly colored in bold panes of red, orange and blue, reminiscent of a circus tent. Made in a tough double-ply canvas, with an insulating airspace between the two fabric layers, like double glazing, to ensure a controlled temperature inside the tents, it is designed to be put up using a system of masts, ropes and pulleys. Once erected, it is held up by counterweights formed of enormous water-filled balloons. Putting more than a dozen major artworks, each worth in the millions of dollars, in a tent in the middle of nowhere might be thought to raise some security concerns. Still, Mr. Seban, while declining to go into details, said adequate precautions had been taken. Occupying the parade ground of an abandoned army barracks on the edge of town, the colorful tent brings a dash of energy to the drab surroundings of Chaumont, a post-industrial town once known for its glove-making industry. The architects Renzo Piano and Richard Rogers drew inspiration from Le Corbusier’s ideas in their groundbreaking 1972 design for the Pompidou Center, with its blue and green exposed ducts and red external stairway elements. The decision to endow the Pompidou Mobile with a bright fairground exterior was also a nod to its Paris parent and “a homage to Renzo Piano and Fernand Léger,” Mr. Bouchain said. In planning the museum’s itinerary, the Pompidou invited mayors from all over France to put in bids. Chaumont was one of the first to respond, Mr. Seban said, and the fact that the nearest museum was 100 kilometers, or about 60 miles, away also played in its favor. Still, the decision to start the ball rolling in Chaumont probably owed less to competitive tendering than to the fact that its mayor, Luc Chatel, is minister of education in the government of President Nicolas Sarkozy. In Chaumont, the schools program has been fully booked for the museum’s three-month stay. Total attendance, meanwhile, has surpassed expectations, at an average 700 visitors a day and 2,000 on weekends. With the Pompidou mobile journey on its way, Mr. Bouchain is now working on something very different  the next Monumenta installation at the Grand Palais. It will be a minimalist production, he said, with the artist Daniel Buren. Chaumont-sur-Marne, a town of 30,000 in eastern France, is the first stop of the new Pompidou Mobile, a traveling gallery of modern and contemporary art conceived by Alain Seban, current director of the Pompidou Center in Paris. Curator Emma Lavigne was chosen to put together “La Couleur,” the Pompidou Mobile’s first show, which opened in Chaumont in mid-October and runs there until 15 January. Inside the traveling exhibition’s tents are 14 masterpieces from the Paris museum’s permanent collection. Artists include modern masters  Matisse, Picasso, Braque, Léger, Alexander Calder, and Niki de Saint Phalle  and a sprinkling of contemporary artists including Olafur Eliasson and Bruce Nauman. Entrance to the museum is free, a rarity in France. The museum will next set up camp on its tour of France early next year in Cambrai, then heads to Boulogne-sur-Mer in May. Read more.